The Developing Diversity Directory has been developed by Faith Matters over the last year and through contact and consultation with over 480 mosques in England. Faith Matters undertook focus groups with Muslim women in England around 5 key areas they wanted to see within mosques in terms of core service delivery and each of the mosques was then benchmarked against the 5 areas. The top 100 which met 4 or 5 of the key criteria have been published in this directory and reflect service provision as of February 2010. 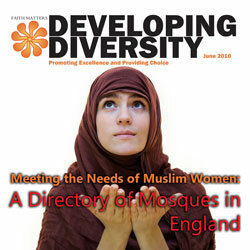 We hope that this directory serves Muslim women in giving them a snapshot of mosques that provide good services to them and in assisting other mosques in giving them contact points and mosque institutions that they can work with to ensure that best practice is implemented within their respective institutions.